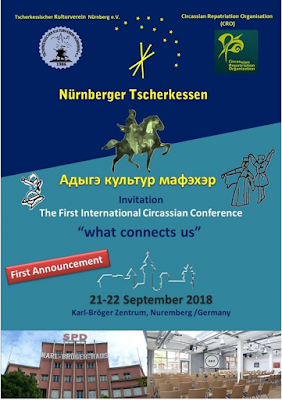 The Circassian organization in Nuremberg and the circassian repatriation organization (CRO) in Canada host on 21. And 22. Sept. 2018, at Karl-Bröger Centre in Nuremberg, the "first international circassians conference". a series of cherkez from clubs as well as cherkez activists, intellectuals, professionals and businessmen are looking forward to this event which is as a platform for meeting And the exchange of ideas and expertise. The Circassian communities in motherland and diaspora are very rich in experts in many different areas. It is extremely important to create a platform that can be used to bring together all these experts. The motto of this conference is "what unites us". there are many issues that fit, such as education, economy, politics, innovation, art, culture, music, history and many others. • Organisation of civil society in civil society and the creation of a more open public to act in the process of integration and integration Answer to the political questions about the cherkez identity in the diaspora. • The influence of globalisation on cherkez tradition, art, culture, music and challenges related to maintaining the language. The official language of the conference is German and English, but other languages are also allowed. Prepare your presentations in two languages, in English and in the second language of your choice. Simultaneous interpretation shall not be made available on a permanent basis. Those who need an entry visa to Germany please contact their nearest German Embassy. Contact us if you need a letter of invitation to participate in this conference. Please note that the c280 can take up to two months so that visas must be submitted in time.